History Adventuring: Why do people live in Phoenix, Arizona? Why do people live in Phoenix, Arizona? I'm interested in the history of Phoenix, and I collect old photos, and I always wonder "why do people live there?" I'm writing this in Glendale, a suburb of Phoenix, in the summer, and it will be another day that will be hot enough to fry and egg on the sidewalk. I mean, really, who would live in a place like that? And since over 4 million people call the Phoenix metro area home, and Phoenix itself has been around since 1870, I get a lot of answers. Don't get me wrong. I love Phoenix. I hope that I can live here until they carry my old bones away. And since I've made arrangements to donate my carcass when I'm done with it to the University of Arizona Medical School, which is in downtown Phoenix, I'm hoping to be able to stay in my favorite city for as long as I can! My category, which is fairly large, is someone who escaped the snow and cold of Minnesota. I also fit into another category, as I lived in Southern California for many years, and I am in the category of people who got out of Southern California. So I have a lot to talk about with people who have no desire to see snow again, and have no desire to stand in line for just about everything (that would be Southern California). If you're wondering what my California looked like, watch L.L. Cool J's video about it - Going Back to Cali - I don't think so! Another fairly large category that I've found is people who grew up in Phoenix. I gotta tell you, these people boggle my mind. I can always recognize them by their comments on my Phoenix page, usually "with that jacket that person is wearing, it can't be summer!" I suppose if Phoenix had its own language, there would be a 1,000 words for heat, kinda like the 1,000 words for snow which Eskimo is supposed to have, which it doesn't, because Eskimo isn't a language. How these kids managed to play in the summer I have no idea, but the people I talk to just shrug their shoulders and say, "We were kids". I feel very fortunate that I have found a place to live in that I love so much. Phoenix has been good to me, and I always figured that the heat of the summer keeps the riff-raff out. For me, the size of the city is just right, not too big, not too small. Believe me, after living in LA, Phoenix felt like a small town, and it felt good. But not so small that they roll up the sidewalks at night. Still, it's kinda nice to see the traffic lights here in Glendale flashing red or yellow in the wee hours of the night. So I ask people why are they living in Phoenix? And when I read about someone, maybe a pioneer, I ask the same thing. There are so many reasons, and to me they're all interesting. 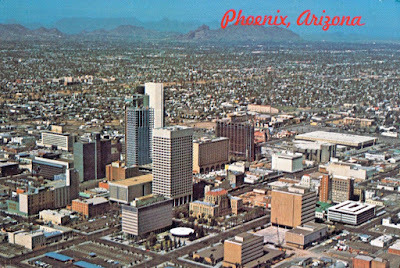 Image above: Flying over downtown Phoenix in the 1970s. From a postcard.